I was elected to Oldham Council for the first time in May 2015. I am now Deputy Leader of the Opposition having previously held the Health and Wellbeing Shadow portfolio. As a consequence, I now have the Finance and Corporate Resources Shadow portfolio. I am Shaw born and bred and very proud to represent all residents in the community. I live in Fullwood, Shaw, with my wife Hazel, who works as an education advisor and is also an Oldham Borough Councillor. We have two children, my son works in the home furnishings industry having completed an NVQ Level 3 in software development at Oldham College and my daughter is a pupil at Crompton House School studying for her A levels. 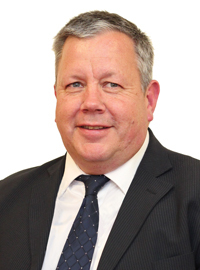 My interest in council affairs began during my time served as a community police inspector in Shaw and Royton when I worked closely alongside elected local councillors and council officers. I have also been a school governor for 15 years and am currently serving in this capacity for Crompton House School and East Crompton St. James. My passions in life are helping to make Shaw a great place for people to grow up, live and work, and – when I have time – motorsport.